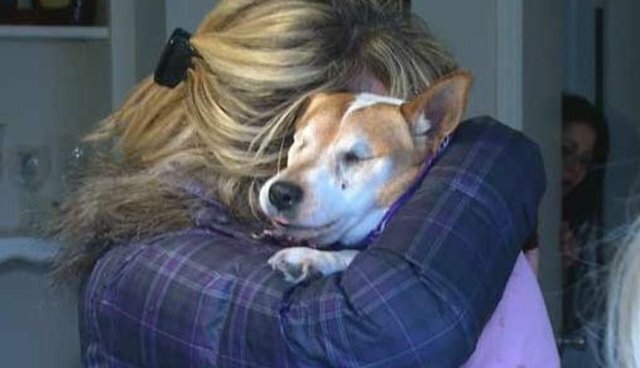 A blind Jack Russell terrier who was inside her owner's truck when it was stolen has returned home safely thanks to the help of a kind stranger and social media. Kansas resident Cindy Sundgren, who was visiting Oklahoma, hopped out of her truck for a moment to check out of her hotel, leaving her dog, Scout, alone inside the cab. Before Sundgren knew it, someone had jumped into the driver's seat and sped off with Scout. "He had to be watching and waiting out there, it happened very fast," Sundgren told CBS News. "We ran out the door, that thing was going 60 miles an hour outta here." A distressed Sundgren and her family immediately took to Facebook, posting pictures of 11-year-old Scout in paid advertisements and pleading for information from anyone who might have seen her. 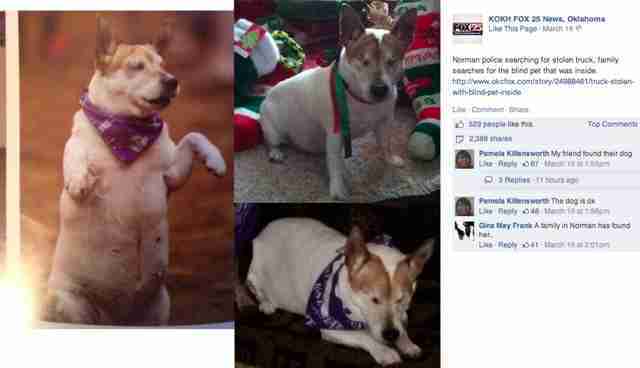 Fox 25 News in Oklahoma City picked up the story as well and added photos of Scout to their Facebook page, broadening the scope of Sundgren's search. Meanwhile, Crystal Torres, who lives at an apartment complex just two miles from Sundgren's hotel, found Scout sitting in the courtyard outside her building, waiting patiently in the same spot for several hours. According to Sundgren, Scout will often sit in the same place without moving if she finds herself in an unfamiliar location with unfamiliar smells; without the help of sight, Scout is reluctant to trust just one sense and instead stays put. Torres, sensing that the dog could use some help, decided to bring Scout inside. "I took her in, put her picture on Facebook, 25 minutes later, I'm getting messages," Torres told KWTV. One of Torres's friends happened to see both her post and the photos from Fox 25, where she quickly commented that Scout was safe. Within half an hour, the message made its way to Sundgren, who was able to hitch a ride to Torres's apartment to be reunited with her dog. "I used to make fun of Facebook, but I never will again," Sundgren told The Dodo. "It is a powerful tool of communication, and without it we wouldn't have found Scout. It's amazing." Sundgren's truck has not yet been recovered, but she says that's okay. "I'm thrilled, I mean, I can't tell you how happy [I am]," she said. "I really was afraid I would never see [Scout] again. It's a miracle." Photos via KWTV and Fox 25 News OKC.